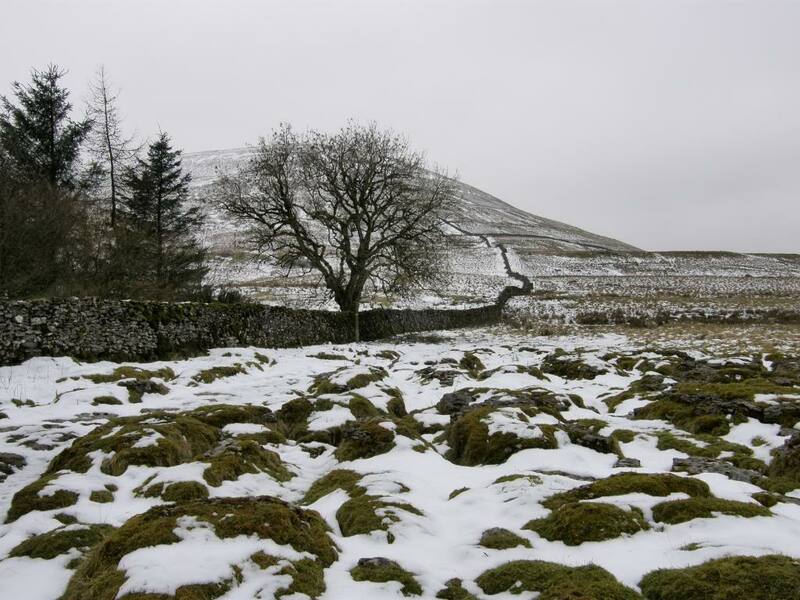 From the road near the Ribblehead Viaduct, walk North West up to Winterscales farm. 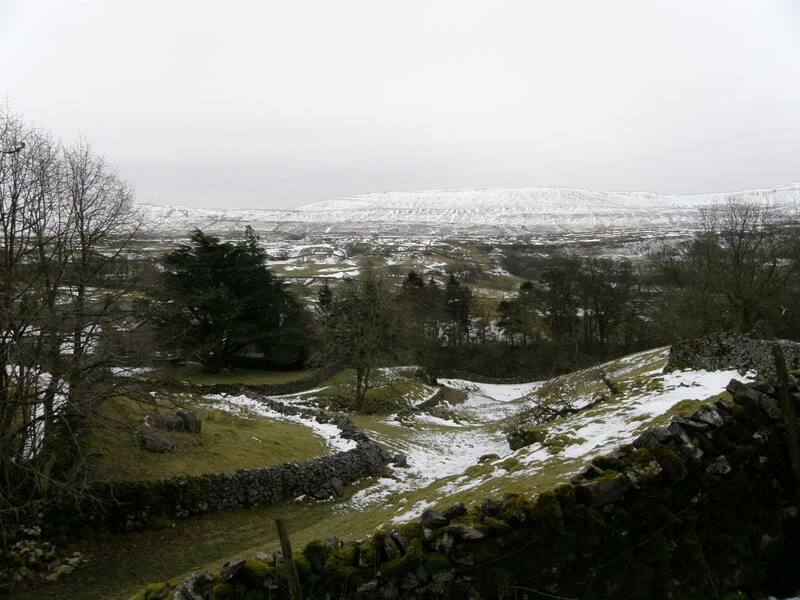 Then turning south West, walk along the base of the Whernside escarpment, before turning down to Chapel-le-Dale and across the valley towards Ingleborough. 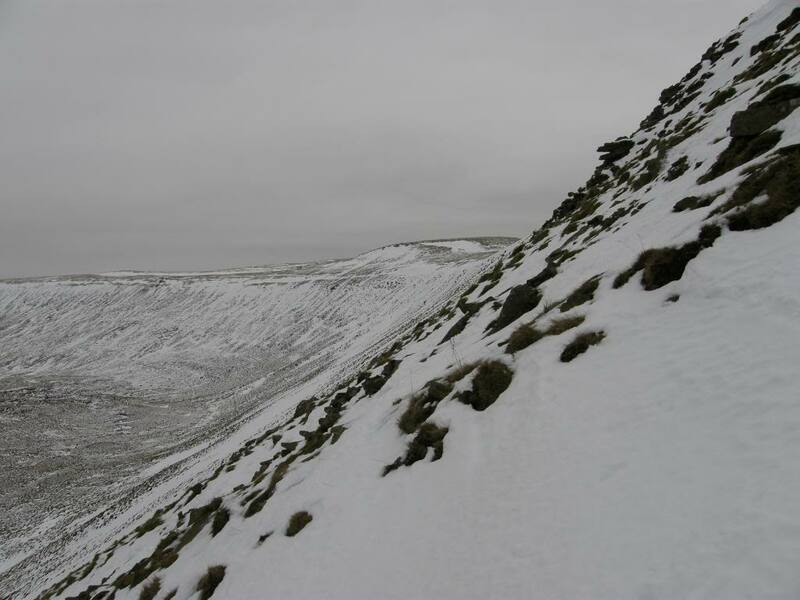 Then back down to Simon Fell, on towards Park Fell before returning back to the car. : 11 miles on Memory map – I had my Satmap but had the wrong map in - doh! 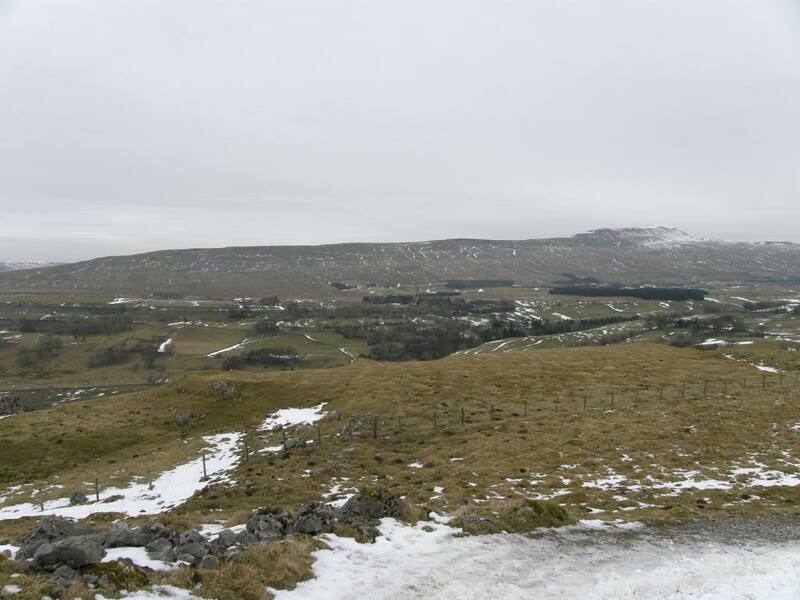 The day started out dull and remained dull throughout – good job the walk was anything but dull. This was the second week where I had back to back walks in the snow, but I didn’t feel too bad today, just a little slow for most of the way up the steeper bits. I had my new GPS handy today, although I didn’t really need it as we could see most of the route wherever we happened to be on it. 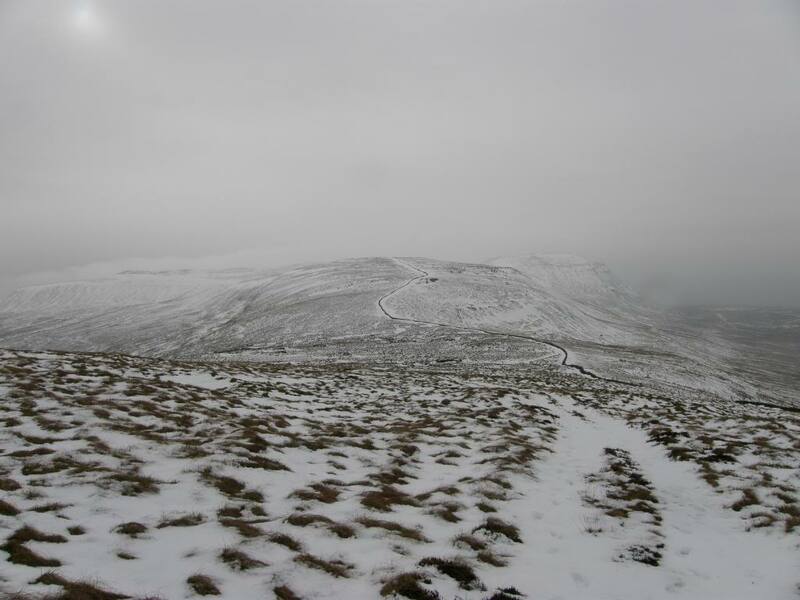 Stuart had picked Ingleborough for another good stomp. Thankfully there has been a thaw this last week, but it was still cold enough up here for the icy ground to be treacherous in places. It wasn’t a very inauspicious start for my use of the Satmap Active 10 as I had the wrong map card in it today so I only got the GPS map. I also didn’t set the time properly, or calibrate the compass – but I will master it before I need it in anger I suppose. Stuart promised that there would be a Tea Van – called the Fourth Peak – parked up close to the car when we finished the walk, so I set out already looking forward to a piping hot cuppa to end the day. 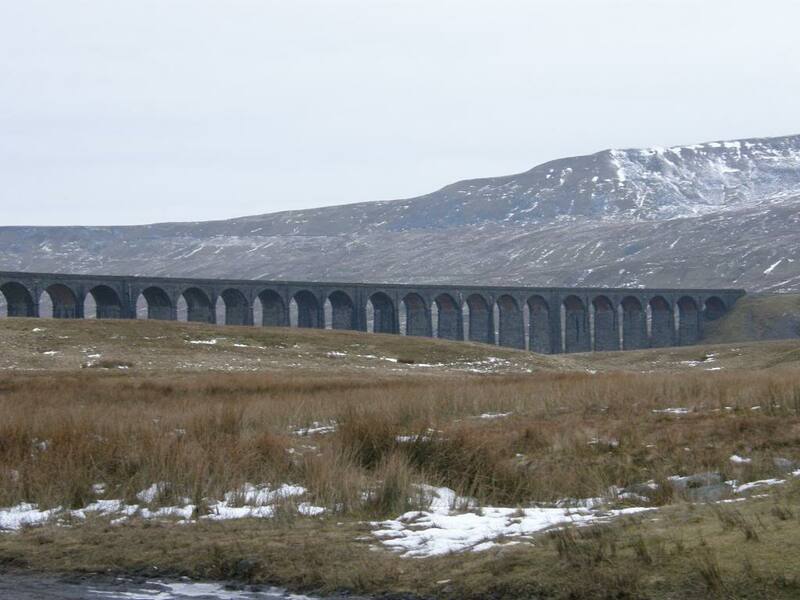 We set off at a gentle pace admiring the Ribblehead Viaduct, another great monument to Victorian engineering and the route of the Settle to Carlisle railway. I’ve yet to travel on this route but everyone says how beautiful the countryside is up here, and it certainly is a very distinctive limestone landscape. 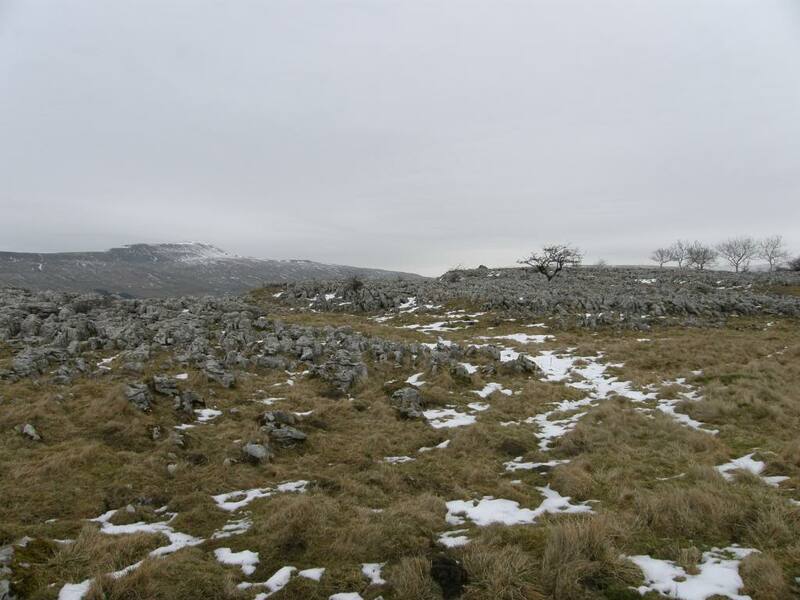 The Victorians were very partial to pinching lots of limestone pavement for their rockeries and follies, but thankfully much of the best parts are now within the national park and preserved for us all. I studied limestone environments at University and wouldn’t you know I’ve forgotten most of it, although I get occasional flashes of brilliance from the back of my bonce – but then again that could be the sun reflected off my follicly challenged head! 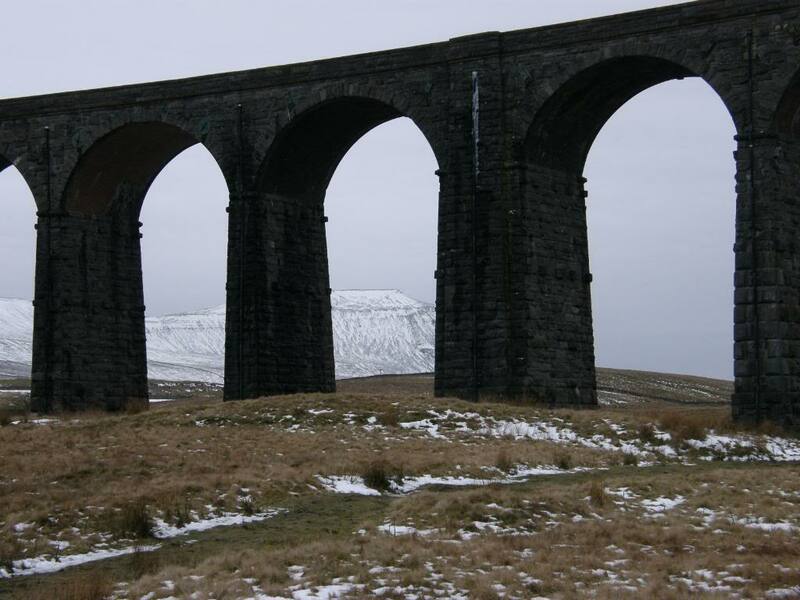 Enough I hear you say, get on with it – alright did you know that there are 24 arches making up the viaduct? No, I didn’t either until I counted them just now on the photo. The first half of this walk is along well made tracks and in warmer times will be easy to stride out along. 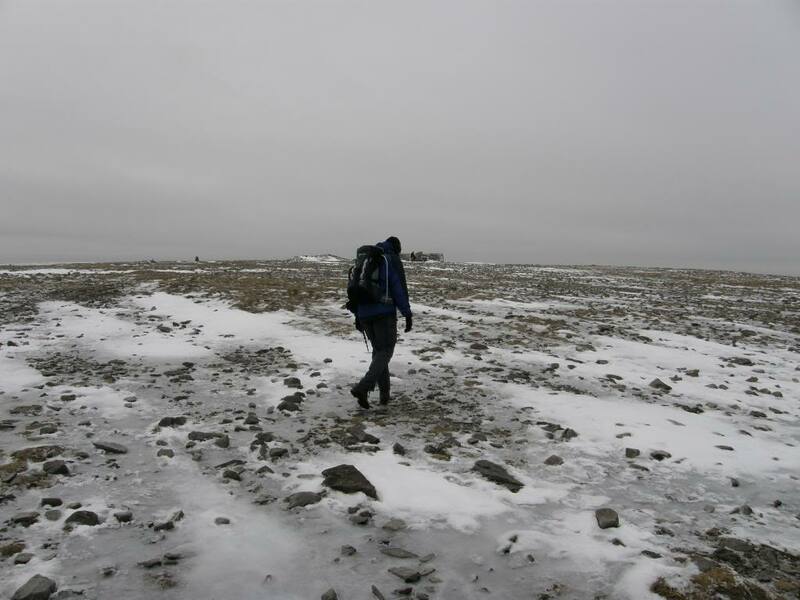 Stuart was worried that he seems to be getting slower as time goes on, but today’s limiter was ice – on the tracks and up Ingleborough. We averaged 2mph, which was OK taking into consideration all the stops we made. He was a bit peeved as we set off as he had left his big camera at home, but in reality it wasn’t a great day for taking pictures – dull, dull, dull. Even the hot air balloon we saw soaring in the distance was grey, and didn’t show up on the photos I took. 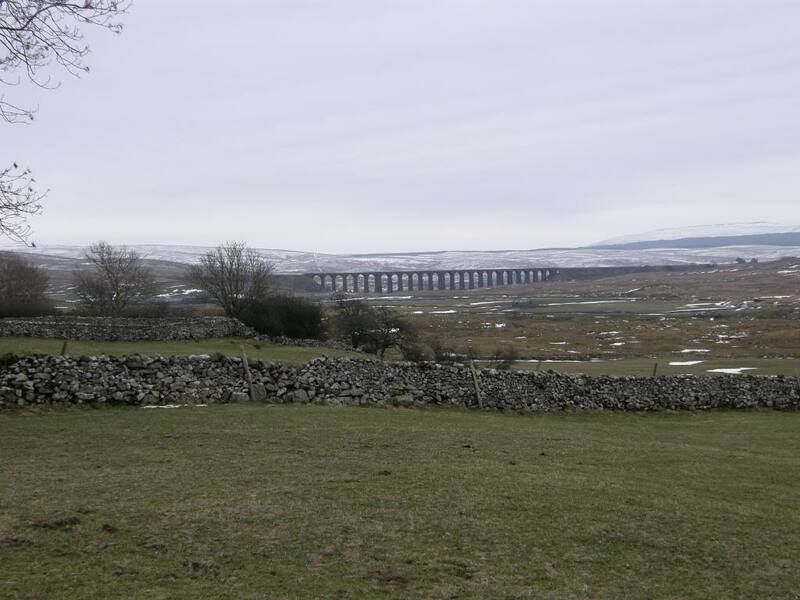 We walked North West up towards Winterscales farm, alongside the viaduct while admiring Ingleborough through the arches, before turning through a tunnel under the railway line. We watched a freight train rumble slowly past, no doubt full of roadstone from the nearby quarries, and close by was a Heron with his head hunkered down into his body – no fish to be had through the ice. 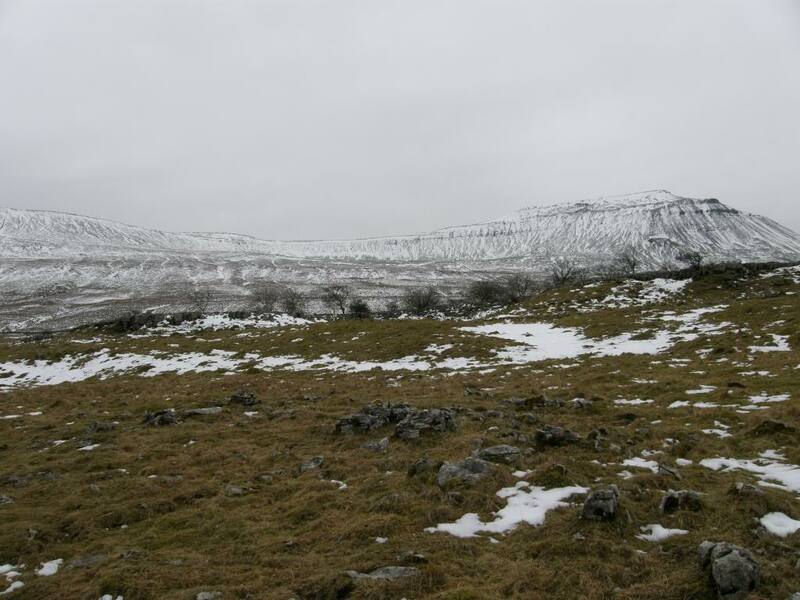 Ingleborough was an ever present square lump that was in our vision whenever we looked over in that direction, no wonder our ancestors chose the site to have a hill fort on top of its summit. 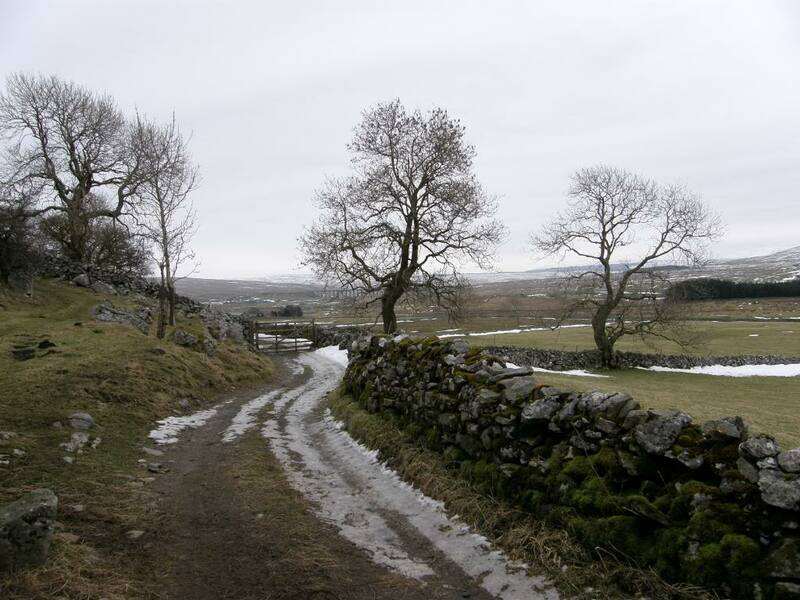 There are some wonderful place names in the Yorkshire Dales and this area had a few of its own. 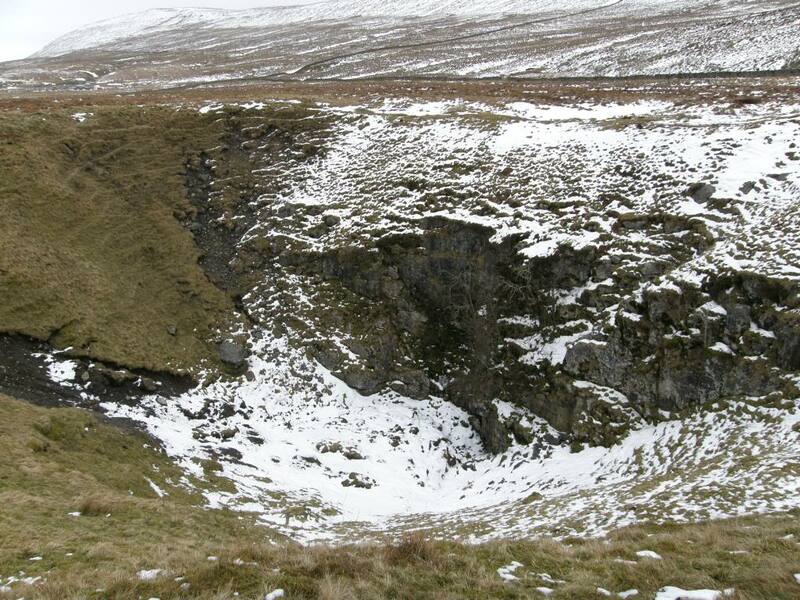 Places such as Foul Gutter Ridge, Lockdiddy Hill, Horsing Stones, Braithwaite Wife Hole and Tatham Wife Hole to name but a few – it must have been hard work being married back then. 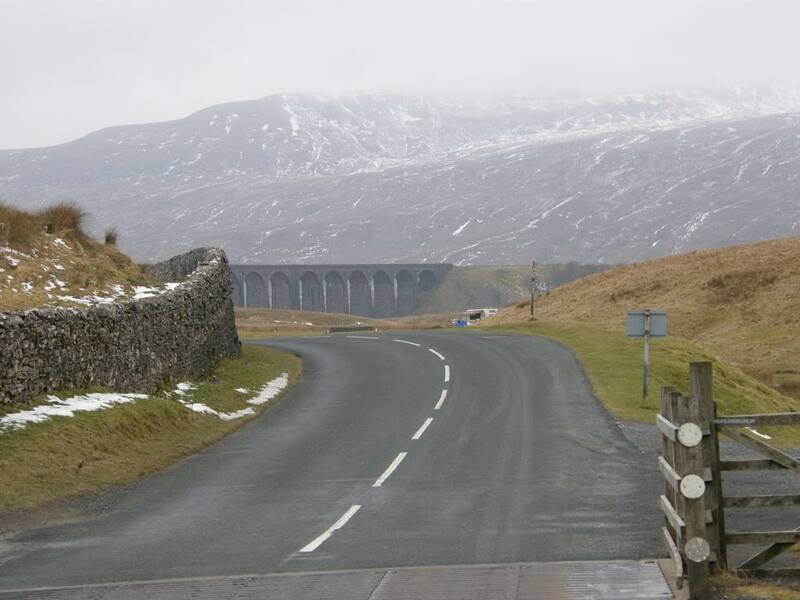 Our route took us along beneath Whernside at the base of the escarpment and along an old farm track that must have been in use for a long, long time. 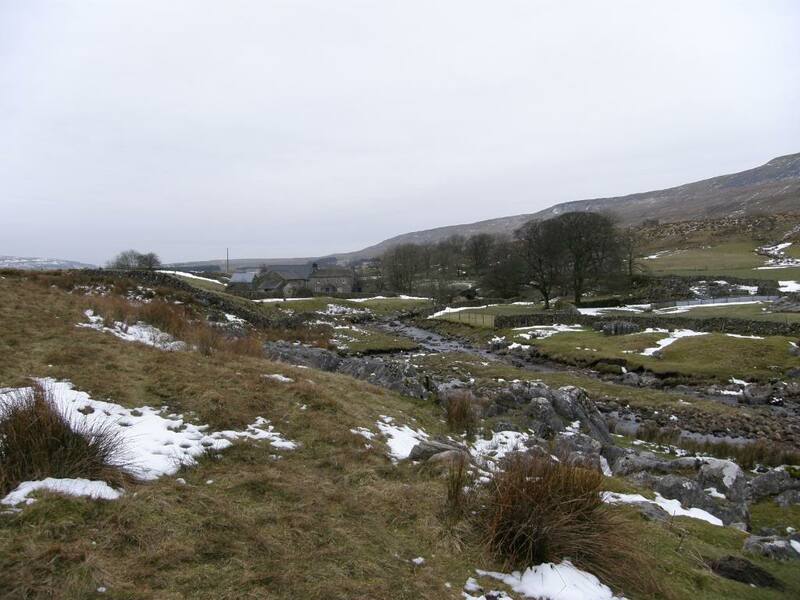 It looked a bit like James Herriot countryside – probably because it is. The limestone used in the buildings gives the landscape a very distinct feel, and I almost exclusively associate it with rural farming. 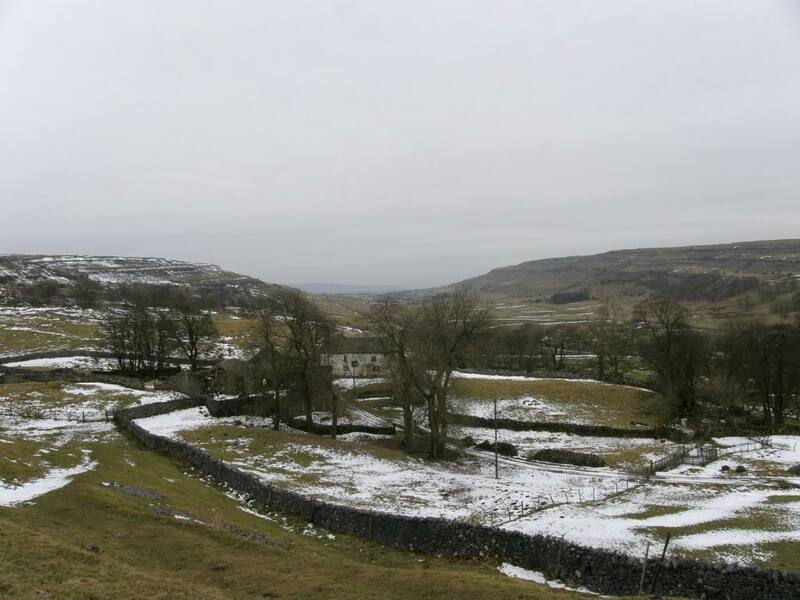 The farmsteads along here are nestled into the hillside backing onto an outcrop of limestone, and we passed an old hall that is being slowly renovated, followed in short succession by a couple of doleful looking donkeys in a garage space – one of which could only be bothered peeping over his partition; a garden full of Yorkshire terrier pups doing their best to try and terrorise us; and an alley of used tyres. A bit bizarre why they couldn’t store these in a better place, or maybe they are bad drivers and need some extra protection while navigating these lanes? 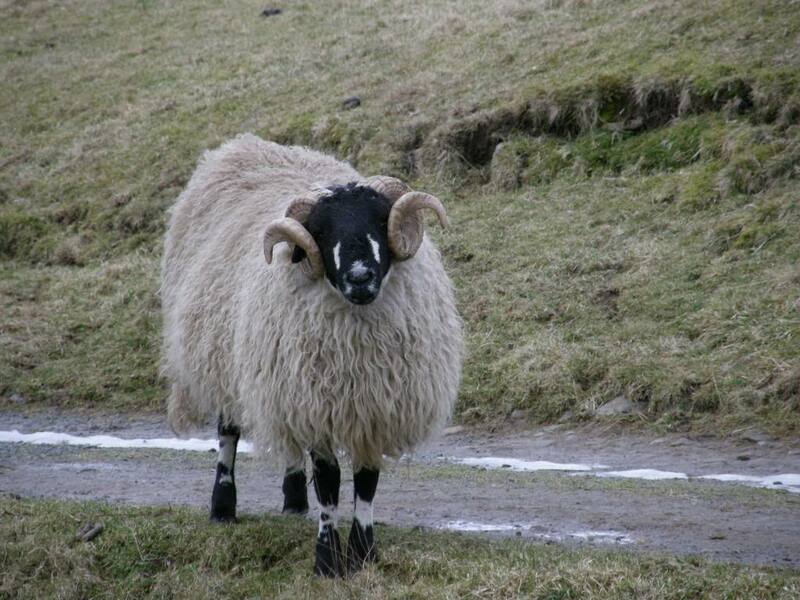 We continued along as far as Ellerbeck before turning towards our destination for today – meeting a sheep that is the symbol of the Yorkshire Dales – you know the one with the horns. The road led us down a gentle slope towards Clayton-le-Dale, and then a little steeper as we came into the sleepy hamlet. 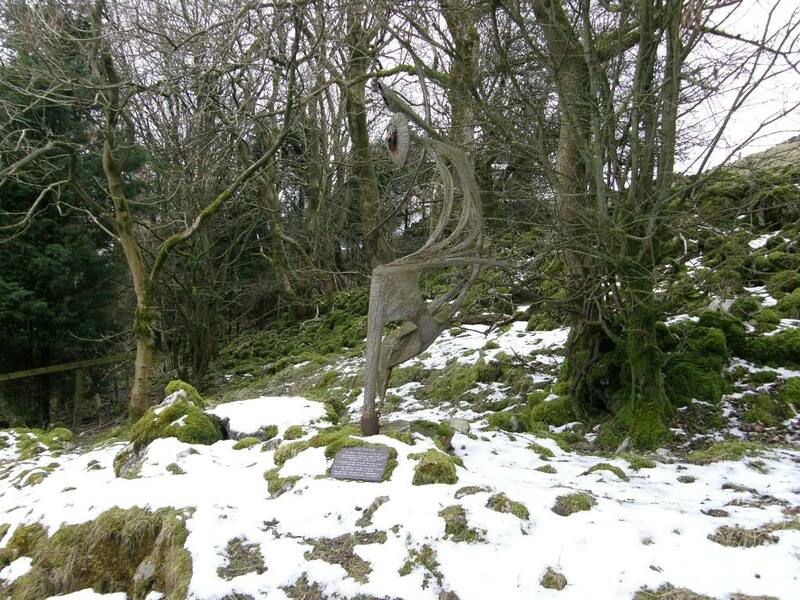 We passed by a sculpture that had been rescued from the bottom of Hurtle Pot – vandalised in the eighties. But it now looks well settled into its new spot by the road, although I wonder how many get to see it. Passing by the local church we made our way across the main road and now it was all uphill towards Ingleborough, that was looking white as only Ingleborough can. 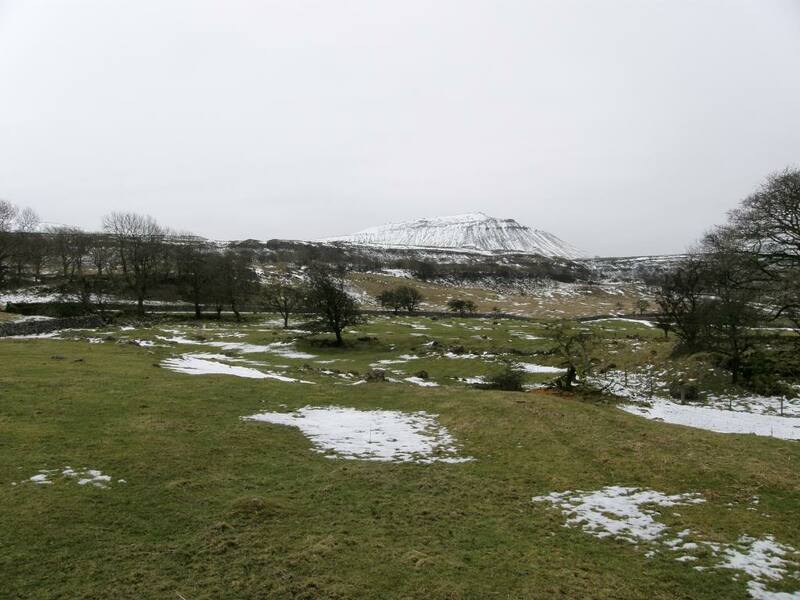 The fields were generally free of snow at the bottom of the valley, which was good news for me as I was feeling a little jaded after yesterday’s exertions down in Wales. 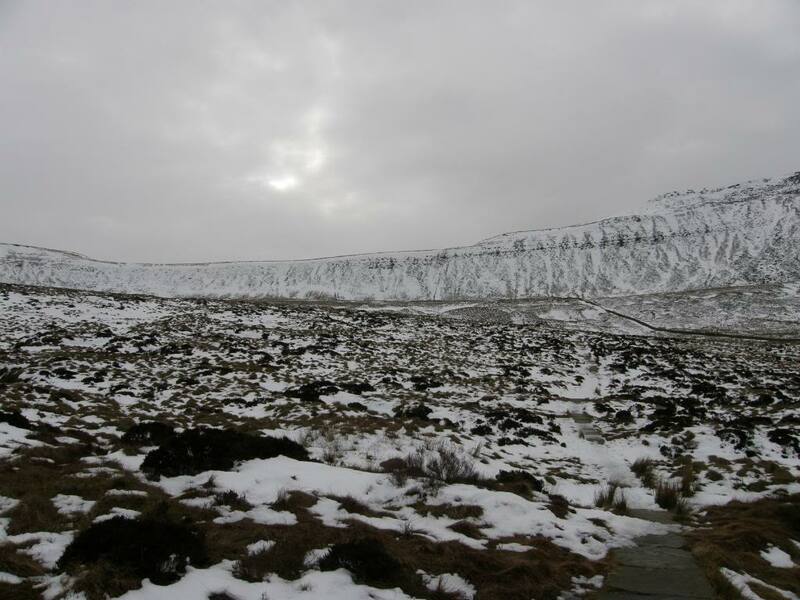 The ascent was steady up towards Souther Scales Scar and the limestone pavement beyond. The pavements here are not as well developed as elsewhere probably due to the nature of the limestone, but are still fascinating to look at on a summer’s day – you can see a lot of unique plants that thrive in this strange habitat of clints and grykes. But we didn’t really pay attention to that today and they would have been full of snow anyway. 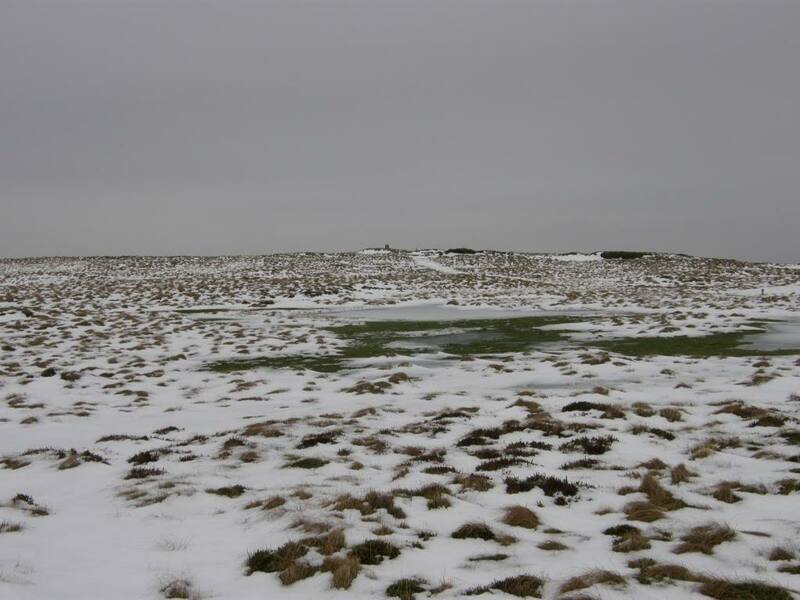 Once we had passed Braithwaite Wife Hole – nobody was in there – the route took us across some very boggy land that fortunately for us was still firm from the winter weather. After climbing up a style the path ahead was paved up the hillside and mostly covered with ice and snow as we reached higher ground. Progress was slow up the slopes as care had to be taken not to go backside over chest as the saying doesn’t go. There is a short section of boardwalk across the worst boggy parts of the nature reserve, home to some web footed species by the looks of things. As we were crossing the moss we could see a dark shape in the distance gently floating away – a grey hot air balloon almost the same colour of the sky. The cloud base was high today so they must have had decent views all around the Lancashire plains. 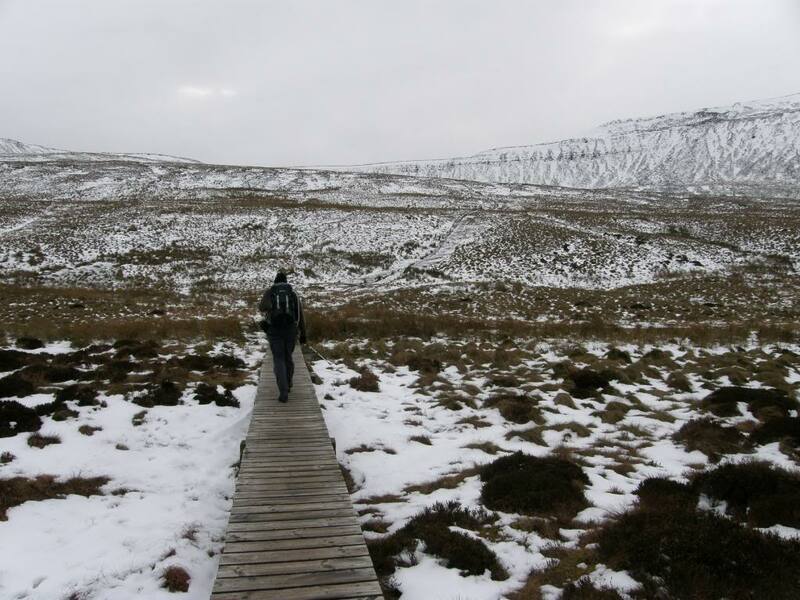 The boardwalk didn’t last very long and the slope steepened towards Humphrey Bottom and the flank of Ingleborough hove into sight. 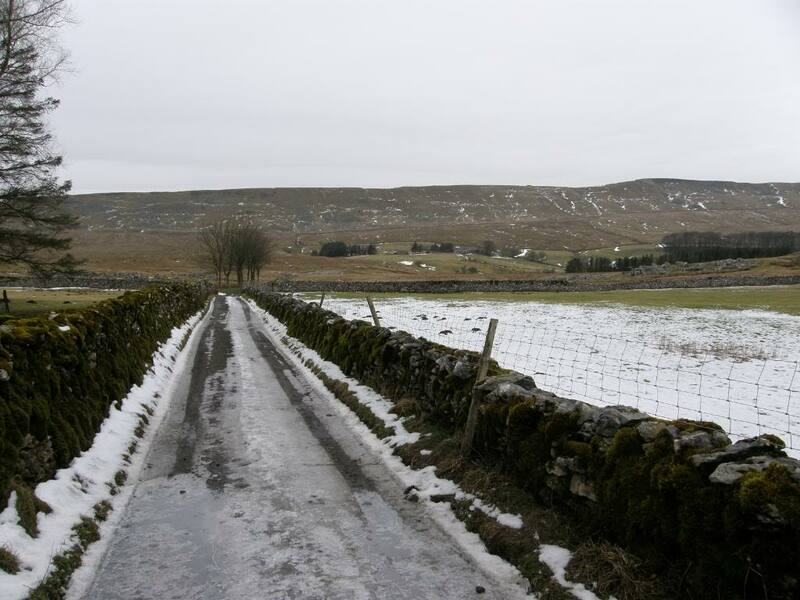 The route we had planned (that’s the royal wee in use) took in the zigzag path up the side of the steep scarp slope that leads up to Ingleborough top, but we knew that it would be iced up today. A couple with a dog came down the slope using the snow as a brake, so we decided to go up the same way they came down. 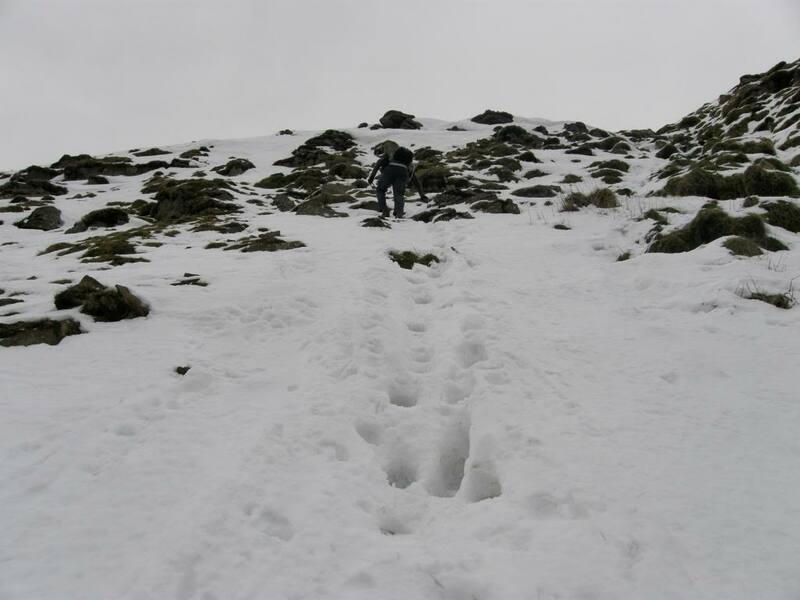 It was a bit like going up a step ladder, with the readymade snow holes easy enough to navigate. At the top of the slope more ice made the going a little precarious but we managed OK.
Once we made the top it was time to put an extra layer on and head up towards the flat topped summit. We were warned that the top was extra slippery and also the approach was icy, so we stayed to the left side of the path, and rock hopped up the steep final approach. Stuart said we didn’t have to do it, but he was joking really – I think. Once we were up on top, the temperature dipped a little as we were open to the elements and it was a veritable ice rink to walk on. I couldn’t really see many of the hut circles remains due to the ice and snow, and didn’t really look for them as it was time for a spot of warming soup at the cross shelter. 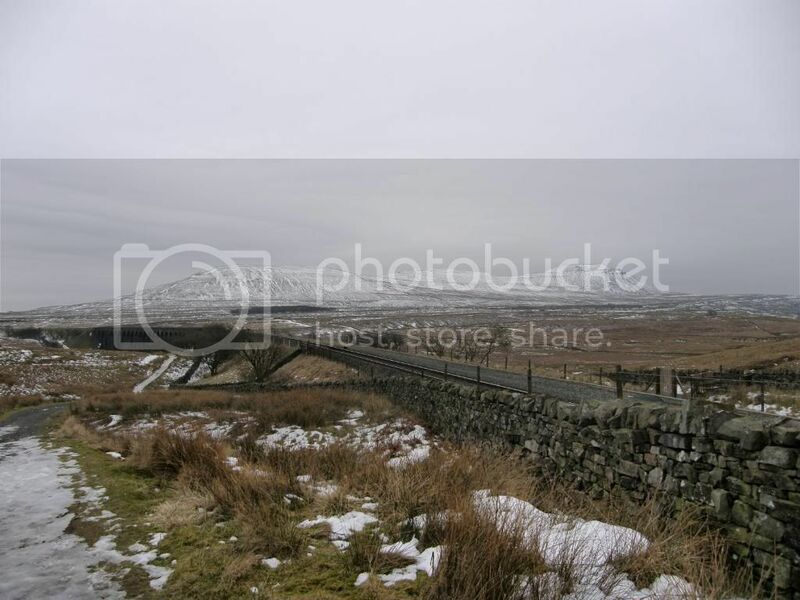 The Iron Age hillfort on the top of Ingleborough is one of the highest in England. 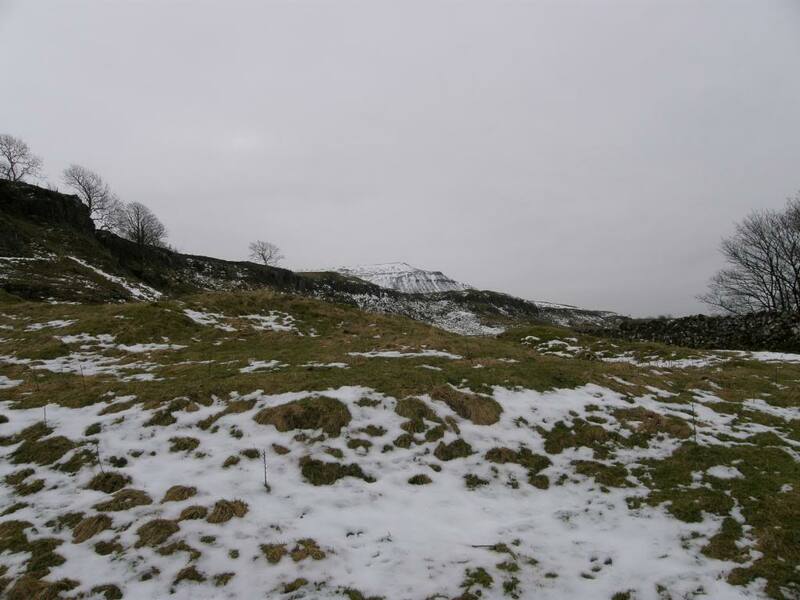 A rubble rampart surrounds the plateau, which was probably a defensive wall when it was built – probably kept the wind out and the animals in as well; and inside this are the remains of about twenty hut circles. 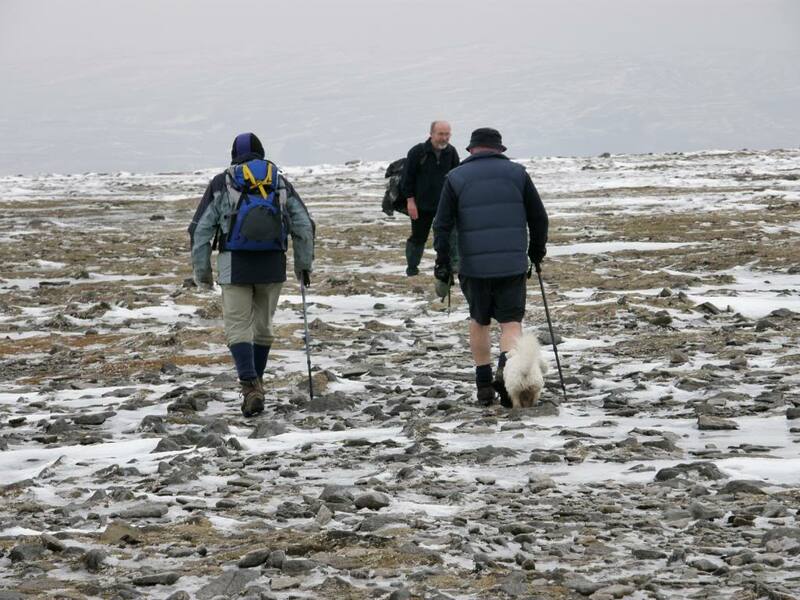 Here we overheard a dour Yorkshireman berating the crampons that someone was wearing. Complaining of the time taken to put them on and off – virtually calling everyone a poufter for wearing them. 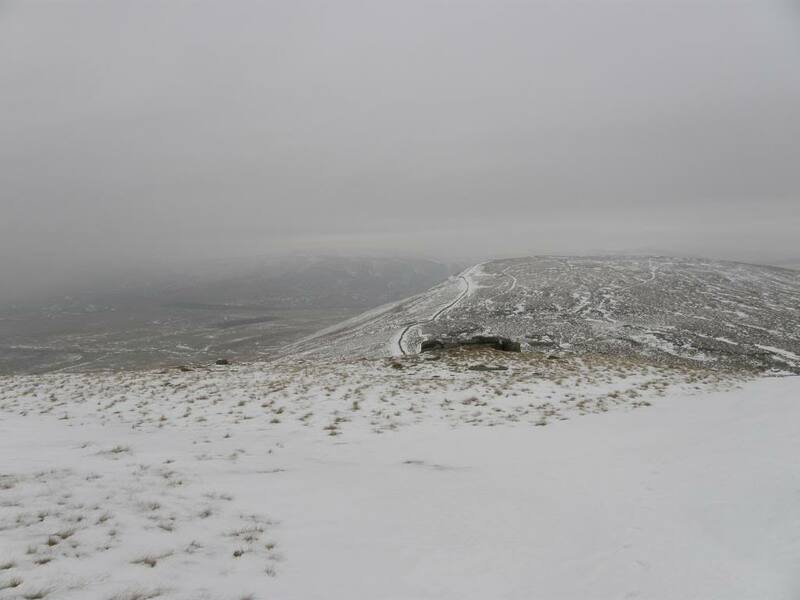 He then sauntered off across the summit with his dog – unfortunately the picture I got was of his dog’s bottom, which meant that there were two arseholes in the picture – no offence to the dog intended. He must have been a hardy sole though as he was wearing shorts, and it wasn’t exactly warm. 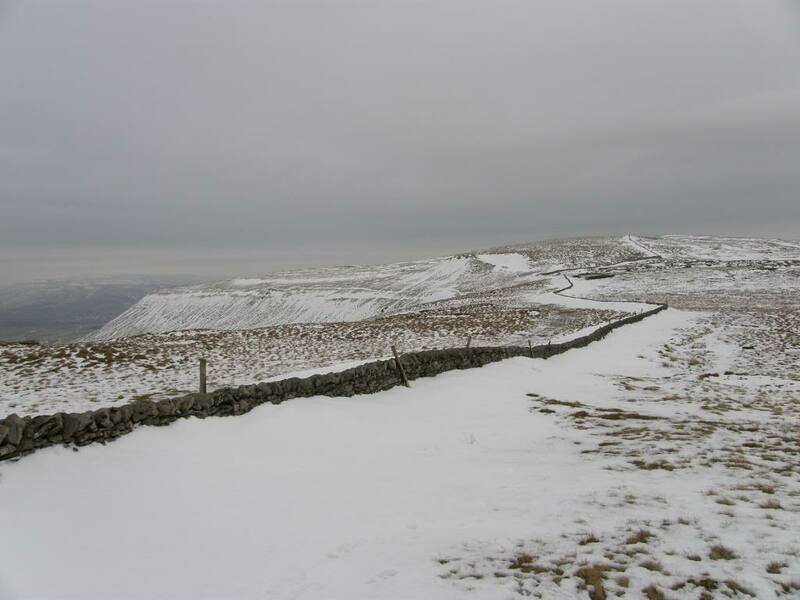 We headed off back down the path we had come up with the crampon man looking very smug as he crunched down the icy path, and as we reached the col above the zigzag path we had a choice of staying left or right of the wall up to Simons Fell. Crampon man went left so we went right, gently sinking into a lovely crisp snowy crust, which was hard enough to take our weight sometimes, then soft enough to disappear up to the knee in places. 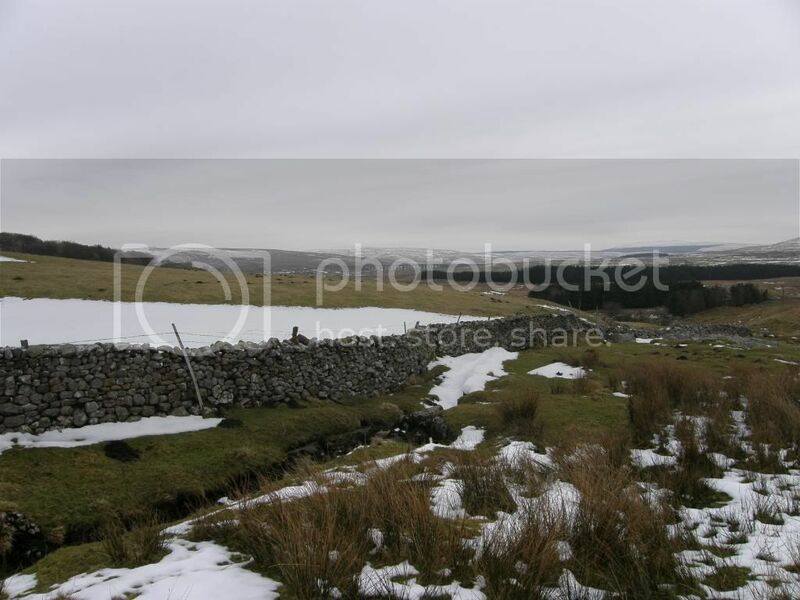 We had to cross over the walls from time to time and although there weren’t any styles, it wasn’t a problem as the snow had drifted up to the wall tops on either side. So we just had to stride up and hop over, hoping that the crust wouldn’t let us down. Behind us the weather was closing in on the summit of Ingleborough, as we made the summit of Simon Fell, which wasn’t marked with a cairn, just our footprints. 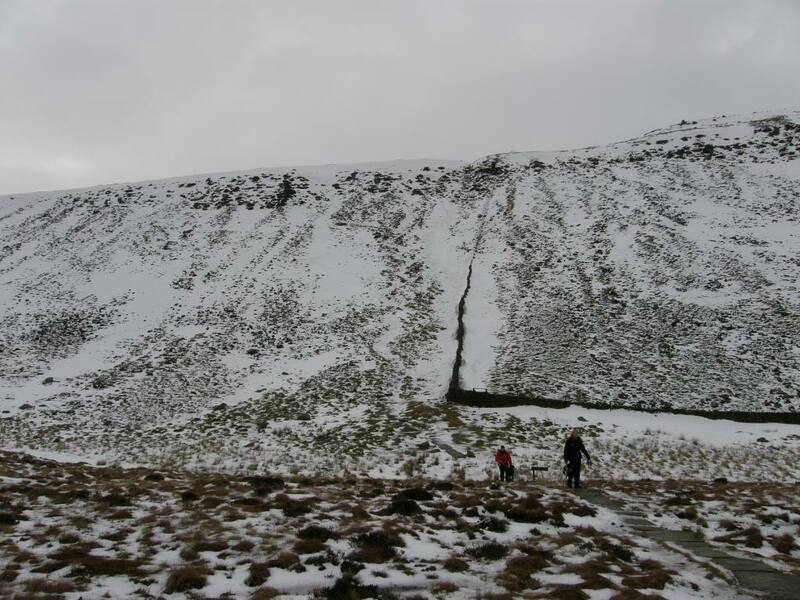 Our route was easy to follow as it just stayed alongside the wall all the way across to Park Fell. The snow had drifted into deep pockets which surprised us now and again, and also didn’t allow us to stride out fully, as doing the splits on an icy surface would have strained a few muscles. 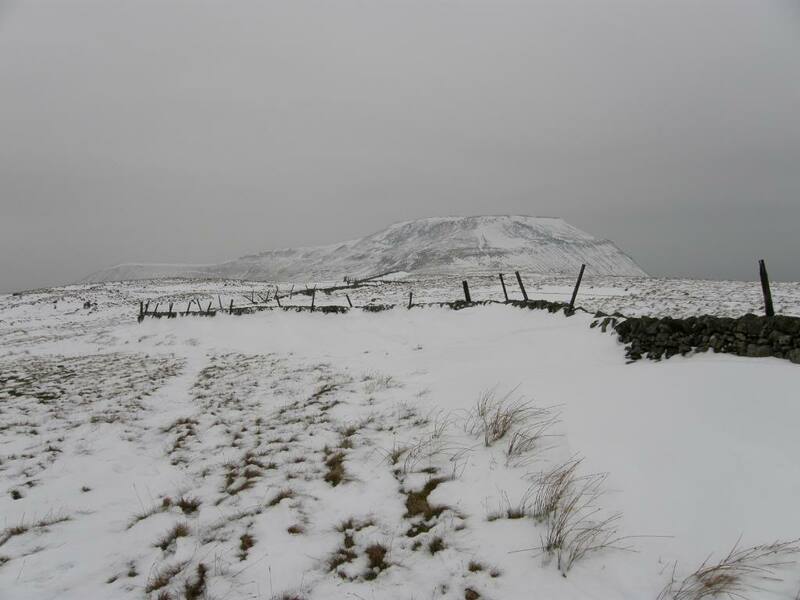 We could pick up the path that climbed up Park Fell long before we got to it, and simply followed the snow all the way up to the trig point. It was fairly gloomy now, but it looked like we would beat the weather back to the car, and as we navigated down the slope off Park Fell Stuart decided to provide some entertainment. I heard a bit of an anxious cry, followed by 6ft4in of fell walker hurtling down the slope, legs in air and he certainly reached the bottom of the slope a lot quicker than I did - that’s competitive walking for you. Shortly after this I saw three black grouse flying off into the distance – I’m sure they were laughing. We followed a straight path down to a farm, passing some mossy limestone pavement and then turning along the Gauber Road at a place called Gauber. From here it was a short walk back along the road to where we had set out from earlier and I’m sure I could see the steam rising from the Fourth Peak tea van. We passed by a field called Gauber Limekiln Pasture, and there it was a limekiln beside the road – opposite was a field called Dismal! My pace quickened as I heard a cup of tea calling, and I was served up a steaming cup full by the happy proprietor – he doesn’t get busy until the three peaks season starts. 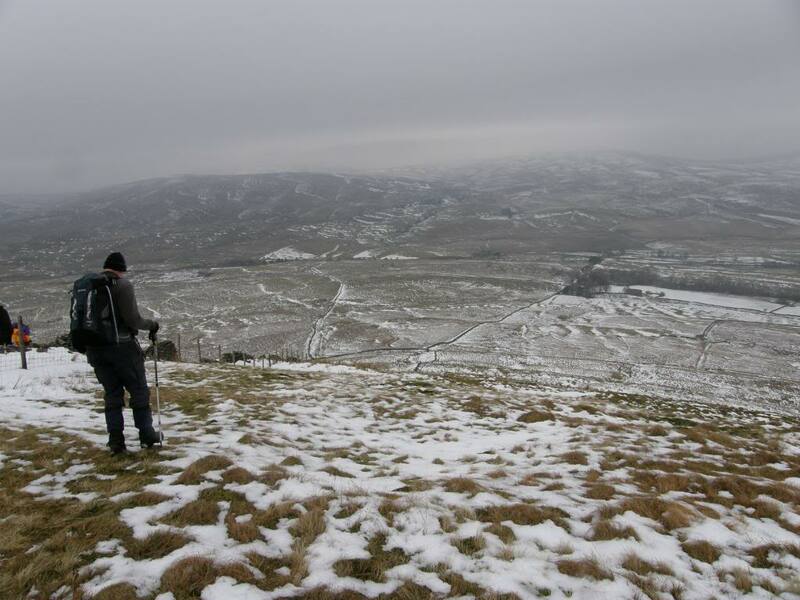 A grand day out (again) - but that’s enough snow walking for now thanks.